Harmonica looks to non-experts like a simple, primitive, old instrument. We have needed something on the web showing people what chromatic harmonica really is and its musical value. Mastersofharmonica.com is the best website I know of for harmonica lovers. It has a beautiful new look and is a perfect starting point for people who want to know about the chromatic harmonica. I like the blogs and that people can share their thoughts on, and love of music on the Facebook page. I appreciate the tutorial sections personally, they are very complete and well done. With the retirement of Toots Thielemans, the honor of being listed as the finest chromatic harmonica jazz player is being defined as we speak, surely on the short list is Stefano Olivato. His playing exemplifies a deep knowledge of all things musical, and his riffs and jazz improvisations are measured and timeless, with control of technique reflecting world class talent. He is surely one of the best in the world, and may be THE best. Stefano Olivato…truly a Master of Harmonica. An interview with Stefano Olivato. I studied bass but from the beginning I loved to play many instruments; bass, guitar, keyboards, drums and of course harmonica. My mother gave me when I was a boy an old Crometta. I played it for many years as a joke. It had two or three broken reeds and some note out of tune. I was for twenty years a professional bass player. About ten years ago I realized that during the tours I wasted too much time travelling, sat in the airports or on the bus and I told to myself: “I need a small, smart instrument to have always in my pocket”. I bought a new harmonica and everything begun. How did your path in music study begin? Every student spends years of his life with an outcome in his mind: to be a musician. Instrumental technique is only maybe 30% of the whole. The rest is musical theory, harmony, rithmic feeling, knowledge of the standards, the past masters and so on. A good player knows what scale to use over a chord progression, but mostly a musician has to put his emotions into music. This is the meaning of music: it communicates nameless emotions, something inside you that you can’t express otherwise. You must have a perfect tecnique to forget while you play. As I told you before, when I begun to study harmonica I was a professional bass player. I knew scales, harmony and styles. I only needed the 30%: technique. I played scales and arpeggios many hours every day, scales and arpeggios. Then I begun to play jazz standars over the Aebersolds and with a band. In the early times I played bass in the band and one or two songs with my harmonica. It’s an easy way to begin because the audience is deeply impressed by a bass player that plays well another instrument. Only many years later, about in 2005 I made my first concert as an harmonica player. About the technique: to me, the main problem was to feel exactly the distance from the holes. This is the big problem also for my students. Do you utilize Pucker or Tongue Block for embouchure? I play pucker. There isn’t a real reason, it was’nt a choice; simply it was easyer for me to begun with pucker and so I went on. They say that tongue block is the best way to play big jumps; I think it’s probably true. Sometimes I tryed to practise tongue block but it’s not for me, I’m too lazy to change at this point. I use tongue to play octaves: I plug three holes in the middle with my tongue and I let the air pass on the sides. You play both jazz and classical. What are the main differences you sense? In jazz language a part of the sound is made by undone notes, false notes, some “wrong” note played during the melody research. Nobody plays the melody of a jazz tune exactly as written. This is the beautiful of jazz: every session is unique, completely different from any other. Classical music is the opposite: it’s the perfection. I’ll always remember my first classical playing. Someone asked me to play Gounod’s Ave Maria, a very simple wonderful melody. It was about ten years ago. In that period I was playing with my band some difficulf bebop melody as Donna lee, Anthropology, Joy spring. I was already knew in Italy as an harmonica virtuoso… I thought “ if I can play Donna Lee, of course I’ll play this stuff with my eyes blinded… well, I was terribly wrong. In the middle of the song I played one single, damned, wrong note. In one second I was lost forever with no mercy, no way to find the point, no improvvisation, scales, patterns, blue notes to rescue me. One wrong note in classical music is a complete disaster, the falling of a mountain. What about your last classical CD: Stefano Olivato plays Vivaldi and Marcello? It was a challenge. A good friend of mine is the director of a very famous baroque orchestra based in Venice: The Venice Baroque Orchestra which recorded for Sony, Deutche Grammophone and so on. He told me that a jazz musician couldn’t ever be able to play classical music. Don’t say something like that to me: I am very, very competitive! So, i began to study like a fool. Vivaldi lots of hours every day and after three months I called him :“I am ready for Vivaldi RV 352, whenever and wherever you want.” I rehearsed with the orchestra and after nine months we had a production, a label, and we recorded the new CD. It began as a joke between friends but it was also my chance to discover a new world. Do you prefer a club or theatre concert venue? During my carreer I had the honor and the pleasure of playing in many of the most famous theatres in the world: Carnagie Hall in NY, La Fenice in Venice, Olimpya in Paris, Madrid, Berlin, London, Frankfurt, Bruxelles etc etc… All these wonderful theatres have the glamour of the history, places where every single note is incredibly weighty. They stretch your concentration at the maximum. There are you and the music. The audience is far away and often, because of the lights, you can’t see them. To play in club is a collective experience. You are mixed with the people and you can feel immediately their feedback. Maybe theatre is better for classical, club is much more exiting for jazz. I am very intrigued by Stefano’s comments in this interview. First, I’m not at all surprised that a gifted bass player would have the ability to play virtuoso harmonica, as bass has drawn some of the top world talents in our lifetimes: and here I speak of Jaco Pastorius who could play every part of a piece on his guitar base in ways that still astound all who hear his CDs. 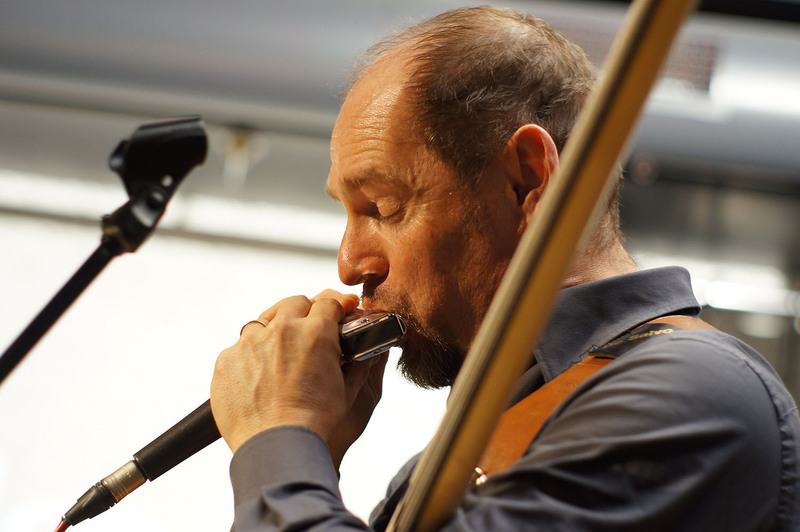 It was the accessibility of the chromatic harmonica, it’s ability to travel easily that started his journey with this instrument, and what is true for Stefano is true for us all…the harmonica is very accessible, both in terms of cost and ease of carry. Stefano speaks of the difficulties of accurately finding the right hole, and of course we can all relate to that challenge. I am especially intrigued about his observations on classical music and performance technique, and the finality of a “no mistakes” policy therein. Along this line, I remember at tinme years ago when I was interviewing a well-known guitar professor and we were discussing a recent CD he’d released. We were talking about the various artisitic interpretations possible on a given piece on the CD, and I asked him to play one piece with a different style…to show me what it could have been had he taken another approach to the piece…what it was like before he’d decided and locked its sound…for many classical players do “lock” their sound on a piece. A little bit after that, I interviewed a jazz performer and asked them to do the same thing…provide me with variations on a theme they’d written. He could do anything with the music, and seemed to thrive in the world of what could be, this musician was fluid and free. One after another, the guitarist delighted in giving me variations on the the piece in all the ways it could be varied….different rhythm, different melodic development, etc., and his joy and enthusiasm seemed to climb higher with each interpretation—as he found world after world of sound within the confines of the piece as he saw it. I remember at the time being so very impressed with the freedom of sound exemplified by this jazz musician. Classical music as a rule does head towards what is considered the “correct and appropriate” interpretation of a piece, although to be fair, that definition changes over decades and centuries…even for so called popular music. As an example, the pieces of Stephen Foster (Beautiful Dreamer) are interpreted very differently today than they were in the 1850’s. It worth remembering that in the day they were written, the greats, including Chopin and Listz, found endless pleasure playing their pieces many ways, even farcical, and would compete in evenings at salons in Paris surrounded by friends and music lovers enjoying what we would call improvisation on their own and their colleague’s themes. Turning so called Classical music into a religious dogma of sorts is a fairly recent phenomenon. To some extent, I feel it has limited the popularity of the idiom, as audiences desire variation so very much. The themes which Stefano discusses are timeless and touch some of the root values in music, each of us comes to our own conclusions. Stephen Olivato was born in Venice 6/17/1962, and is considered by many worldwide to be the worlds leading, or one of the worlds leading chromatic harmonica players. He studied at the Conservatorio Benedetto Marcello in Venice, graduated technical and performing arts at the University Ca ‘ Foscari of Venice. Plays bass guitar, harmonica , bass, piano , guitar and drums, and sings. Palace of Congresses S.BENEDETTO OF T.
Since 1995 he heads the most important school of music in Venice : The Sixteenth note . He has conducted seminars and workshops in Italy , Germany, Austria and Slovenia since 2001. Awards include: 2010 he was awarded the Citizen Mestre year for his artistic contributions.